How to measure correctly for a comfortable fit. It is suggested to have someone help you. When looking at dress shirt size the first number on the size tag refers to the neck size, the second number to the sleeve length. As an example a shirt marked “15 ½ 32/33” would mean the man wears a 15 ½ inch neck size and a 32 or 33 inch sleeve length. 1.First measure your neck. Put the tape measure around the largest part of your neck, where you would normally wear the collar when your shirt is buttoned. This is your neck size. The neck sizes in dress shirts increment by ½ inch measurements. If you find you are not quite at the half or whole size go to the next half or whole size measurement. You can also adjust this measurement based on comfort level. For instance if you prefer to have a little more room, add ½ inch to this measurement. If you like a more generous fit, add 1 inch to your measurement. For some men keeping one or two fingers between you and the tape measure is alternate way to add the desired inches when determining neck size. Shirts should button all the way. Do not leave open the top button on the shirt. 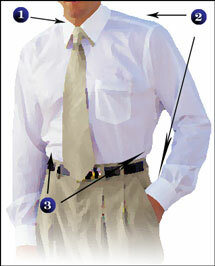 If it feels too tight on you when you button the shirt, it is too small. 2. Next, measure for sleeve length. It is important that your arm is at your side and slightly bent at the elbow. Here is where it is best to have help. Start by placing one end of the tape measure at the middle of the back of your neck; go across the shoulder, and down your arm. You want to follow the curve of the shoulder and the arm, end at the wrist bone. Add 1 inch (rounded to the nearest even number) to this measurement to use as your sleeve length. 3. Finally, some manufacturers also list a waist size on their packaging (most often with athletic cut shirts). To determine the size of your waist, measure around your waist over a shirt at the area where you would normally wear your pants. Keep one finger between you and the tape measure. This is your waist size. Regular Cut - a looser fitting shirt then the Athletic Cut. If the packaging is not marked it is assumed that the shirt is a regular cut. Most stores will have someone available to help you determine your size. Don't feel you have to do this on your own. Try on your interview outfit ahead of time. Your interview clothes should be comfortable enough to wear for several hours. You may be walking, sitting or standing depending on the style of your interview. Be sure after each wearing your outfit looks fresh. Take into consideration your schedule when planning what you need. You may be busy and not always have the time to get things cleaned. Some special attention strategies that can give you a more polished look include a good antiperspirant to avoid underarm stains, having a good haircut and a clean shave. Don’t forget to pay attention to your hands, have your nails trimmed, clean and neat. You might also consider using one of the bleaching products available to have your teeth look great too.